Although we are located in Huntington Beach, we have a close connection with the City of Fountain Valley. Danny Kahale, owner of JUST SMOGS® started out at Courreges Elementary, moved onto Fulton middle school, and graduated from Fountain Valley High school in 1998. JUST SMOGS® offers all Fountain Valley Barons a $5.00 discount towards their smog check inspection. Thank you for supporting our local business. Serving Huntington Beach, Fountain Valley, Seal Beach, and surrounding Orange County for 15 years! Hours: M-F 8am-5:30pm & Sat 8am-3pm. 3rd Left on Kovacs Ln. Please review the JUST SMOGS® site to learn more about the California smog check program. If you have further questions regarding the California vehicle inspection program please call us at (714) 596-1019. 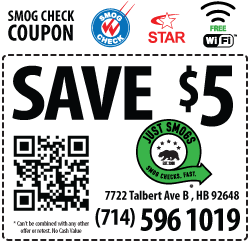 Please take advantage of our smog coupon. When you are ready to make an appointment (optional) for a smog check, call us at (714) 596-1019 or make one online.